Boeing has begun a push to streamline its supply chain, reducing overlap between existing divisions and cutting layers of management and bureaucracy. The company hopes any nonmanagement employment cuts can be achieved through attrition or reducing contract labor, not layoffs. Boeing has begun a push to streamline its supply chain, reducing overlap between existing divisions and cutting layers of management and bureaucracy. The move may reduce overall employment over time, though Boeing spokeswoman Jessica Kowal said the company hopes to avoid nonmanagement layoffs. The efficiency push is driven locally by new Boeing Commercial Airplanes Chief Executive Kevin McAllister and from Chicago by Jenette Ramos, Boeing’s senior vice president of Supply Chain & Operations. 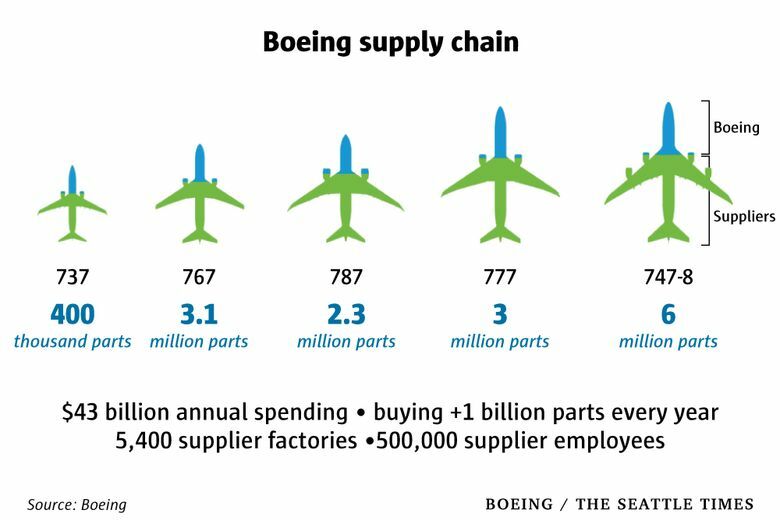 Boeing’s enormous global supply chain delivers more than a billion parts to its assembly plants every year, everything from buckets full of fasteners to entire wings for its 787 Dreamliner. The management of that global network — first of all, determining who will supply each piece of the giant, complex puzzle that is an aircraft, a missile or a space satellite, and then the logistics of delivering those supplies at just the right time — is the focus of Boeing’s plan. One tool McAllister specifically wants to apply is increased use of modern information technology and digital analytics to track supplies and identify blockages in the pipeline. Boeing’s current supply chain has grown organically over many decades with multiple internal divisions all using separate tracking systems. She said the extended study under way will also help Boeing better determine which suppliers are working well and which are underperforming — so that it can allocate contracts accordingly, and in some cases take work in-house. Boeing expects the first organizational pieces of the streamlining initiative — bringing together supplier management, raw-material management and elements of engine systems supply — to be in place by year end.